Thank you all for the extraordinary and overwhelming reception, as well as the kind remarks and feedback that really helped lift our spirits and fill us with confidence for the future. 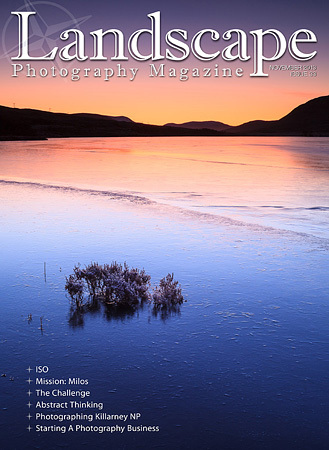 I am talking about the launch of Wild Planet Photo Magazine, of course, the sister publication to Landscape Photography Magazine. The first 3 issues will be free till 14 January 2014, download your FREE issue now! Moving on, let’s take a look of the content we have for you this month. First of all I need to mention the Aperture section. I recently visited the Greek island of Milos with three friends and together we wrote an article that expresses our thoughts on this adventure. Was it as spectacular as we thought it would be? You will need to read the article on page 16 to find out I’m afraid. Then comes my conversation with Erez Marom, a young and very enthusiastic landscape and macro photographer that just turned pro. A very interesting interview and highly recommended. Some of our readers emailed us asking if we could publish an article that would help with starting a photography business. We listened and we are bringing you a series of articles on the subject. Finally, try not to miss the December Christmas Special issue, it’s absolutely stunning. Mike Bell, Elizabeth Restall, David Hay and Dimitri Vasileiou visited Milos island in Greece. In this article they describe their extraordinary adventure. 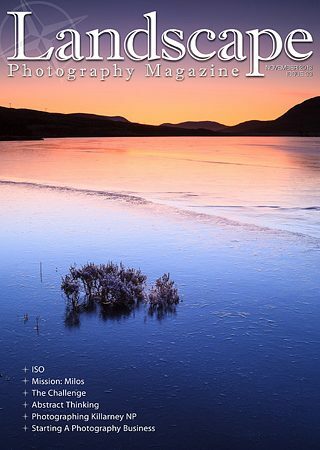 This month in Landscape Photography Magazine we have the pleasure to interview landscape and macro photographer Erez Marom from Israel. There is a big difference between the ISO of a film and the ISO of a sensor. There is even difference between sensors’ ISO. David Hay explains. Landscape photography advice on location research and planning in advance, as well as wisely choosing the camera gear you need to take with you. This month in Landscape Photography Magazine David Hay reviews the book ‘The Art of Adventure’ by landscape photographer Bruce Percy. Are you looking to take your photos to the next level? Abstract thinking, says Ian Plant, is the key to advanced image making. Think about what your photographic work tells the world about you the next time you stand in line waiting for the all-too-predictable in a location already photographed many times before. As photographic tools become more sophisticated, are we tempted to transfer part of our artistic responsibility to these clever devices? Do you plan every single photo shoot or do you go out and expect the unexpected to happen, included a stunning transient light condition? Imagine being allowed to take one picture in the space of two hours. Then, imagine having only two hours to show 15 people how to take a really good picture. The most important tool a photographer has is the eye. There are great pictures all around us, all we have to do is open our eyes and find them.